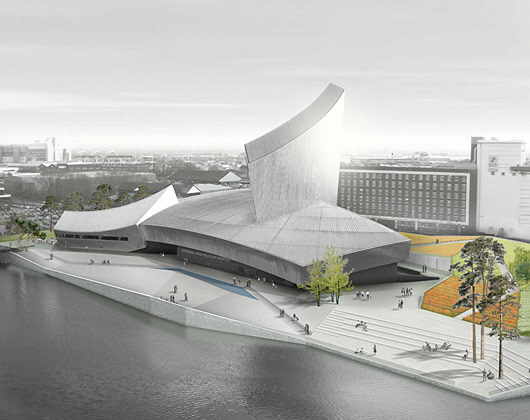 The multi-award winning Imperial War Museum North (IWMN) in Manchester, UK has selected a preferred design team to develop the external spaces of the Museum following an RIBA international design competition and public consultation with visitors and key partners (previously on Bustler). Topotek 1’s original submission stated: “The camouflage patterns used by the military are an abstraction of landscapes of combat. These patterns represent a visual average of the natural environment: the muted green, brown, and ocher hues of typical camouflage are a graphic summary of wild and cultivated places. We wish to confront the global scale of war represented by the building with the local scale where battles are fought. War does not only re-configure lines on a world map, but changes everyday landscapes. a water-sculpture as a focus for contemplation and reflection. These designs are initial concepts and IWMN will now begin the task of fundraising and seeking partners to help realise the project. Once funding has been secured, Topotek I will work closely with the Museum to develop the ideas and create the final scheme. The first phase of development of the outside areas is aimed at completion to coincide with the opening of MediaCity:UK in 2011. IWMN is about people and their stories, about how lives have been and still are, shaped by war and conflict. 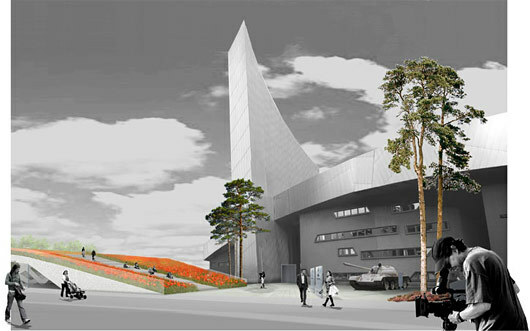 The Museum is located in Trafford in the rapidly developing Quays regeneration area, and the development of MediaCity:uk on the Quays provides the opportunity to capitalise on the international focus that will soon be on the area, and to create a distinctive destination and context for the museum. The external spaces at IWMN must enhance the museum by reflecting its key message that war shapes lives, against its dramatic exterior, enhancing and expanding the visitor experience to beyond the walls of the internal spaces. There is an opportunity to do something dramatic and spectacular that will at the same time integrate with the extraordinary content and design of Daniel Libeskind’s iconic building which represents a globe shattered by conflict. 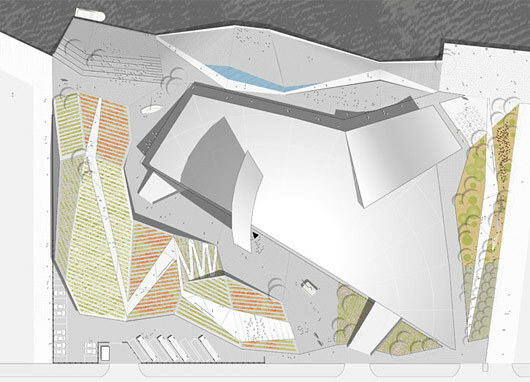 An international competition to design and develop the external spaces at IWMN was organized by the Royal Institute of British Architects (RIBA) Competitions Office. In September 2008, expressions of interest were received from over 50 architects and landscape architects. 5 shortlisted teams were then invited to come up with design ideas in response to a brief. IWM North Director, Jim Forrester set the scene at the outset of the competition: “Our stunning Libeskind building continues to generate much interest and argument, and now, with the next phase of the Quays regeneration underway, we are ready to make more of its setting. The challenge is to make the outside areas of the museum as striking, memorable and rewarding as the building and its displays already are. To achieve this we are looking for remarkable designers with ideas which will give even more substance to our mission”.